Out of the Fire | Only at His Feet! Daniel 3:17 (AMP) 17 If our God Whom we serve is able to deliver us from the burning fiery furnace, He will deliver us out of your hand, O king. Fiery furnace… Trials and tribulations… Having a bad day, week, month, year… Life has a way of jumping up and ‘biting’ you when you least expect it. Bit of trivia for you. Did you know that the big ponderosa pines and giant Sequoia have a unique way of getting their seeds into the ground? Now this is not a great scientific dissertation and I am paraphrasing quite a bit, but if you want you can look it up and find out it’s true. The seeds of these trees are locked inside the pine cones and do you know what ‘unlocks’ the cones? 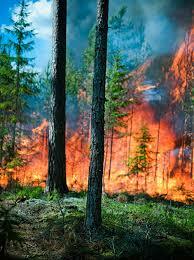 Heat…Fire… It takes a forest fire for the cones to open up and release the seeds so that new trees can grow. It is amazing to me how something in nature can be a parallel for our walk with Jesus. We were never promised an easy time in our relationship with Jesus. In fact, He stated that – hey, the people hate me so you should know they will hate you. (my paraphrase). But when something in life throws us for a loop or seems to knock us of our axis, we can just look God’s word and to the locked pine cones. Going through the fire isn’t easy but with Jesus we will come out of it better than we were before. A new ministry could be grown. A deeper understanding of who God is can be found. There are a myriad of things that we can learn when we are going through the fire. Believe it or not, just like the 3 Hebrew children, we won’t smell like smoke, nothing will be singed and people around us will notice the favor of God in our lives.